Today we are going to talk about the PGA legends of golf that are incredible signers. 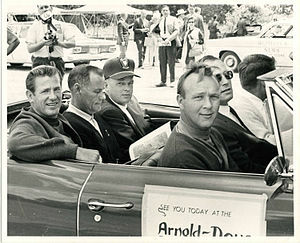 Arnold Palmer – This ambassador to the game is an amazing signers. He loves to talk golf and will do everything in his power to sign an autograph for every fan. Jack Nicklaus – When it comes to signing autographs, he is more cautious than Arnold Palmer but is fantastic never-the-less. Will almost always sign. Lee Trevino – A great guy with a fantastic personality. He is one of the funniest people you will ever talk to. A great signer as well. Hale Irwin – He is a great signer who will sign almost as many things as you give him. I don’t think I have ever seen Mr. Irwin ever turn down an autograph request. Greg Norman – The “Great White Shark” is a great signer as well. He will sign almost anything and loves to personalize items he signs. Craig Stadler – “The Walrus” is very accommodating to collectors. He never turns down a request. A very good person as well. Tim Finchem – The PGA Commissioner is a great signer just like all of those listed above. He represents the PGA extremely well, cares about the fans and never turns down a request. I hope you enjoyed this blog. Please check out my autograph web store at www.autographedfirstdaycovers.com. This entry was posted in Uncategorized and tagged Augusta, British Open, Craig Stadler, Masters, PGA, Tim Finchem, US Open. Bookmark the permalink.